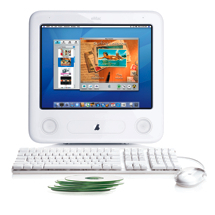 Apple is currently developing and planning to release a new eMac in early fall 2006. Apple started to fade out the current PowerPC eMac back in October when they stopped selling the eMacs to average consumers. According to Apple Insider, the eMac is to disappear completely following the end of the month and is to be brought back two months later in the fall season with a completely new design similar to the iMacâ€™s and a new Intel Core Duo processor, but these changes may force Apple to cut back on the inner components and possibly increase the price. A new eMac can really benefit Appleâ€™s growth in market share, as the students who learn how to use Macs will eventually purchase them for home-use. Now with the inclusion of the Core Duo processor, eMacs will be capable of running both Windows and Mac OS X, allowing students to use both operating systemâ€™s strengths. For example, sutdents can use Mac OS X to edit and burn a DVD for a science class project and then use Windows to make an Excel worksheet for math class. Another alternative to bringing back the eMac is for Apple to design an inexpensive model of the iMac that can not only be sold for educational purposes, but as well to the entire consumer market. This way, Apple can have an inexpensive computer that is bundled with a screen, a keyboard, and a mouse available for consumers.